VALUED EMPLOYEE: Maria Skinner and Peng Uk Lian Chin. PENG Uk Lian Ching counts himself lucky after fleeing his homeland in the northern Chin State of Myanmar, formally Burma, and finding a new life and home. 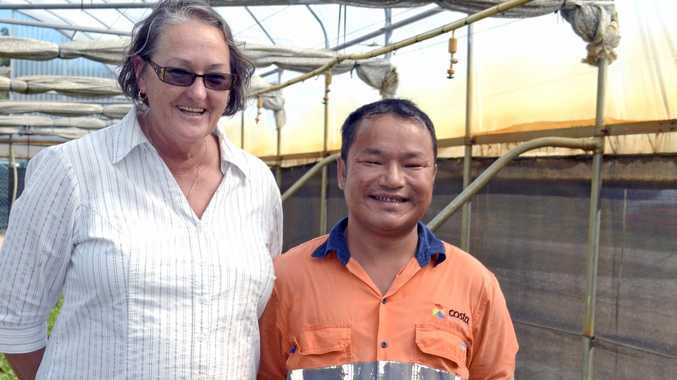 Peng arrived in Coffs Harbour as a refugee in 2010 and in 2011 started working at the Costa farm in Corindi. "I arrived in Coffs Harbour with my wife - my brother was already living here. After I learnt to drive I bought a car. I have saved up and four years ago I bought a house,” Peng said. Chin State, Myanmar, is home to about 1.5million people. Many Chin people fled the country during decades of military rule. Peng said he grew up in the mountains, where opportunities for education were limited. "We need school but sometimes we didn't have a teacher. In my country a seven-year-old is already cooking and cleaning the house,” he said. At the age of 19, Peng went to Malaysia as a refugee and worked as a plumber for nine years. He went back to Myanmar in 2004, where he met his wife, and in 2005 returned to Malaysia. In 2010 he was granted refugee status in Australia through the UNHCR. Peng and his wife now have two boys, who attend the Christian Community College. Variety improvement program nursery manager Maria Skinner said Peng was one of a number of Burmese workers at the Costa farm. "Peng has got a really instinctive feel for the plants and has a great attention for detail. He really cares about everything he does and he is also heavily involved in supporting his community,” Maria said.